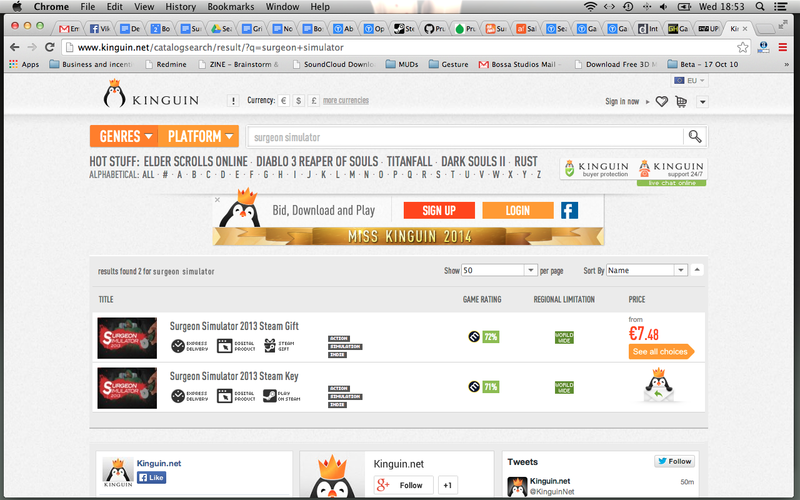 Surgeon Simulator 2013 keys are being re-sold for profit through 7 Entertainment sites Fast2Play, Kinguin and G2Play. It follows the discovery that the network has been selling Humble Bundle keys, a move that Bossa Studios founder Henrique Olifiers says shouldn’t detract from the positive impact of such bundles. 7 Entertainment has since responded to the Humble Bundle re-selling issue, stating that it does not condone such action across its network. 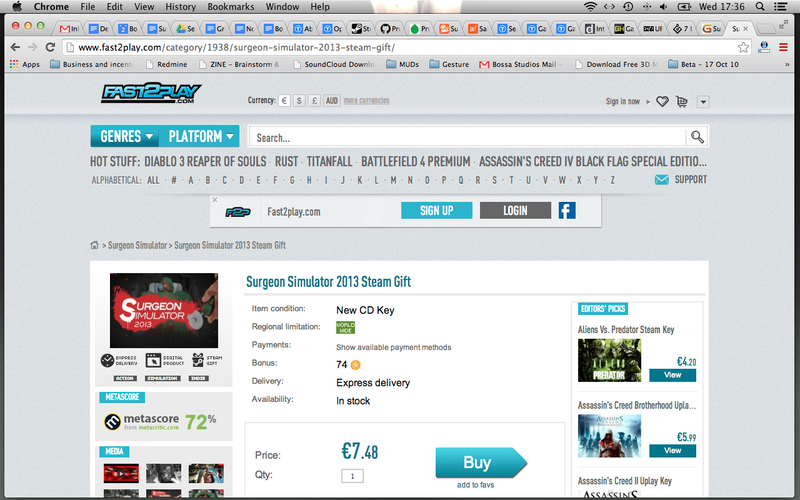 However, the revelation that Surgeon Simulator keys are also being re-sold suggests this activity goes further than previously believed. 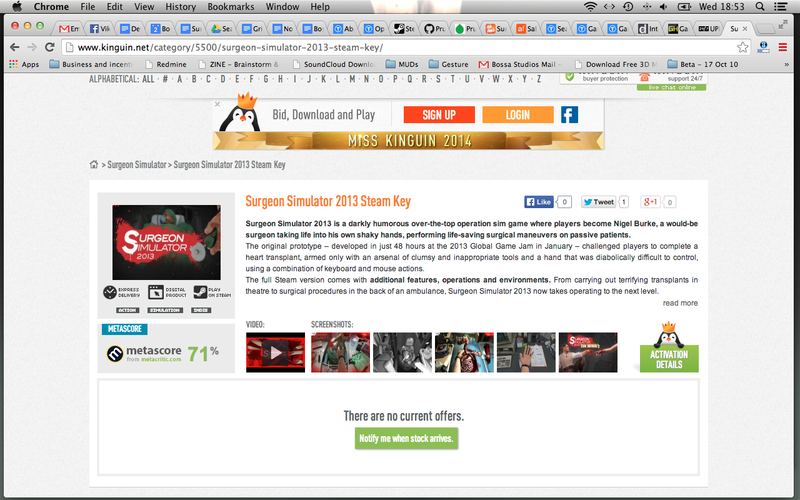 Reaching out to VG247, Olifiers sent us screen grabs of the site, stating that Surgeon Simulator 2013 keys were being re-sold without the studio’s permission, and that the company is yet to hear back following formal complaints. We have a gallery of similar store pages from other 7 Entertainment sites below. Speaking with me over email, Olifiers was keen to avoid bringing negative press to the Humble Bundle concept, as it is an initiative geared towards positive causes. He feels that the negative acts of a few people shouldn’t outweigh the charitable concept. “I have followed the story on Fast2Play/G2Play/Kinguin selling indie games without the right to do so,” Olifiers told me, “and their reply trying to frame the situation as a marketplace, users responsibility thing. So I hope to put them under the right spotlight with my two cents. 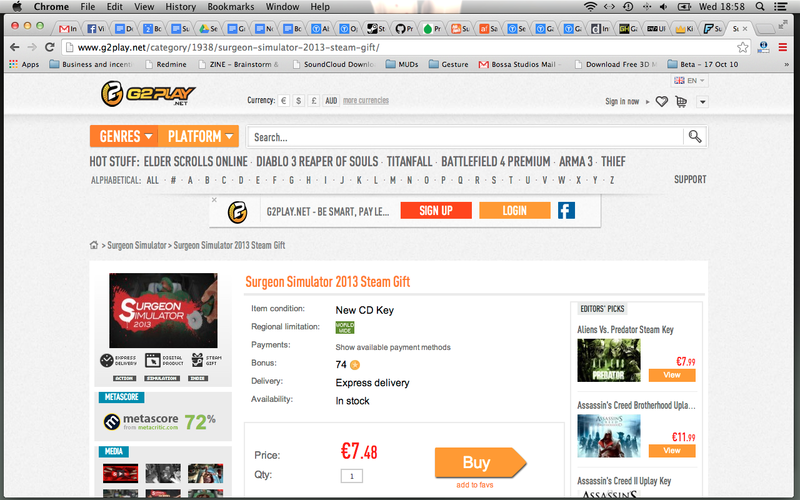 “In the case of Surgeon Simulator, it’s 7 Entertainment itself selling it directly, not ‘users’ nor ‘marketplace’. And they’re doing so without our authorisation. We’re yet to hear back from them regarding this issue. We’ll have more on this matter once it emerges, and if 7 Entertainment responds to these new complaints.